A wealthy lord who happens to be a brilliant scientist . . . an enigmatic young widow who secretly pens satirical cartoons . . . a violent killing disguised as a robbery . . . Nothing is as it seems in Regency London, especially when the Earl of Wrexford and Charlotte Sloane join forces to solve a shocking murder. When Lord Wrexford discovers the body of a gifted inventor in a dark London alley, he promptly alerts the watchman and lets the authorities handle the matter. 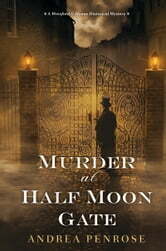 But Wrexford soon finds himself drawn into the murder investigation when the inventor’s widow begs for his assistance, claiming the crime was not a random robbery. It seems her husband’s designs for a revolutionary steam-powered engine went missing the night of his death. The plans could be worth a fortune . . . and very dangerous in the wrong hands. Joining Wrexford in his investigation is Charlotte Sloane, who uses the pseudonym A. J. Quill to publish her scathing political cartoons. Her extensive network of informants is critical for her work, but she doesn’t mind tapping that same web of spies to track down an elusive killer. Each suspect—from ambitious assistants to rich investors, and even the inventor’s widow—is entwined in a maze of secrets and lies that leads Wrexford and Sloane down London’s most perilous stews and darkest alleyways. With danger lurking at every turn, the potent combination of Wrexford’s analytical mind and Sloane’s exacting intuition begins to unravel the twisted motivations behind the inventor’s death. But they are up against a cunning and deadly foe—a killer ready to strike again before they can recover the inventor’s priceless designs . . . The 2nd in the Wrexford & Sloane mysteries. Similar in tone and style to C.S. Harris. Excellent historical background. A satisfying read.